Cats Protection offers free talks to all ages and community groups. One of Cats Protection’s key aims is to educate children and adults about cats and their care. 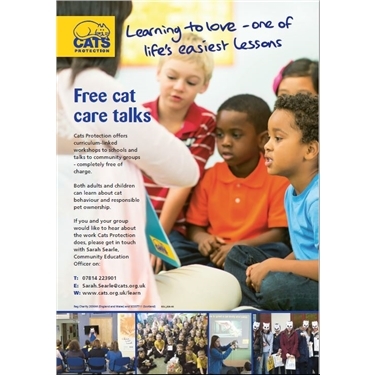 Cats Protection offers free talks to groups that cover a range of different topics including how to keep a cat healthy and happy, how cats communicate and cat body language. Talks are delivered to all ages and community groups e.g. 3 to 18 year-old students, Brownies, Beavers and other Community Groups. We also offer talks to adults and special interest groups. Our talks are fun, informative and can be customised to suit your group or your national curriculum requirements. We also supply free cat goodies so book your workshop today!